Download Prince's funky new single "Da Bourgeoisie"
Prince has been in a downright chipper mood the past few months. First he joined Twitter (where he continues to be hilarious). 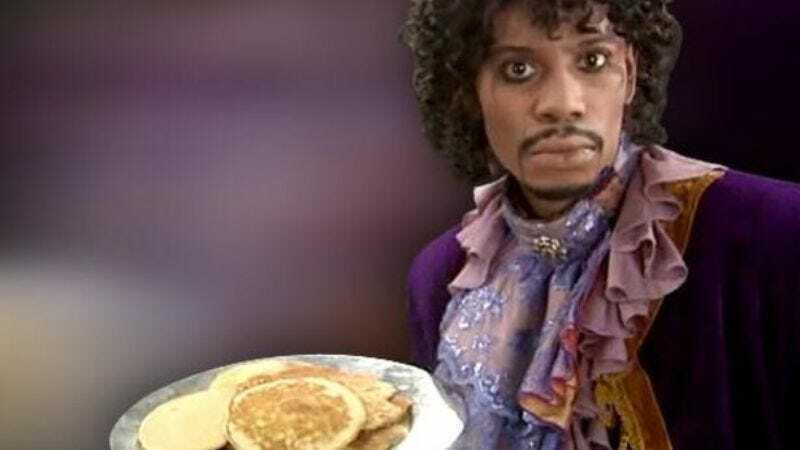 Then he posted a clip of new track “Breakfast Can Wait” with a picture of Dave Chappelle’s Prince character from Chappelle’s Show holding a plate of pancakes. A full music video for that song debuted in October, which revealed a bridge with some Chipmunk-like vocal tinges. Now Prince has forged ahead with the stripped-down funk sound on a new track available for free via Wetransfer. He tweeted that “Da Bourgeoisie” is the title, and “not Ray Charles, Bearded Lady or anything else prejudicial.” It’s got a thumpy bass line, some scratchy blues guitar riffs, and cracking snare drum. Oh, and Prince’s vocals telling the story of his lady leaving him for another woman, “just another bearded lady at the cabaret.” Awkward comparison to a circus freak show aside, it’s a groovy track, and Prince was sure to let everyone know, “No mammals were harmed during the recording of this track.” Which is either comforting, or a warning to all non-mammals that Prince’s music is so funky, it will do some harm.